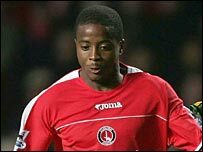 Charlton have recalled striker Kevin Lisbie from his loan spell at Derby. Lisbie had joined the Rams in January on an initial loan for a month and that deal was then extended until the end of the season. Charlton boss Alan Curbishley has decided to bring the 27-year-old back because of a shortage of strikers. Derby manager Terry Westley told the club's website: "Kevin has done well for us and has led the line well and so it is a blow to lose him."